You have worked tirelessly to get an offer accepted whether it has been marketing a property or showing multiple homes to Buyers. But, a mutually accepted offer is just the beginning! 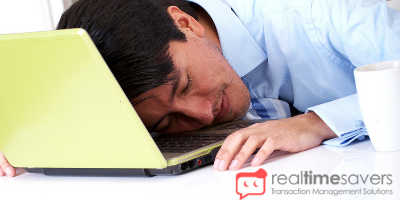 Did you know, the average Broker spends nearly 20 hours after mutual acceptance managing the tedious details of each transaction? Brokers become trapped in a web of communication between the many parties involved, wasting valuable time on the phone and email checking for status updates. Ask yourself this: How much prospecting can you do in 20 hours? At Real Time Savers our Team of Transaction Coordinators free up your calendar so you can spend that time more profitably, finding new clients and selling more property. Interested in learning how your business can benefit from a Transaction Coordinator? Message us today for a free consultation.